Its not just about the receding chin. Although her chin is nowhere as prominent as mine. Look at the cone shaped head, no neck and prominent brow ridge. And we are looking at a female subject.....not male! I'm not even seeing the supposed receding chin of patty. It looks prominent to me,and as much as the brow. Unfortunately I don't see much detail on the face because of angle, brief turn and film grain. The overall shape of the head is pointed but a sagittal crest isn't clearly the culprit. 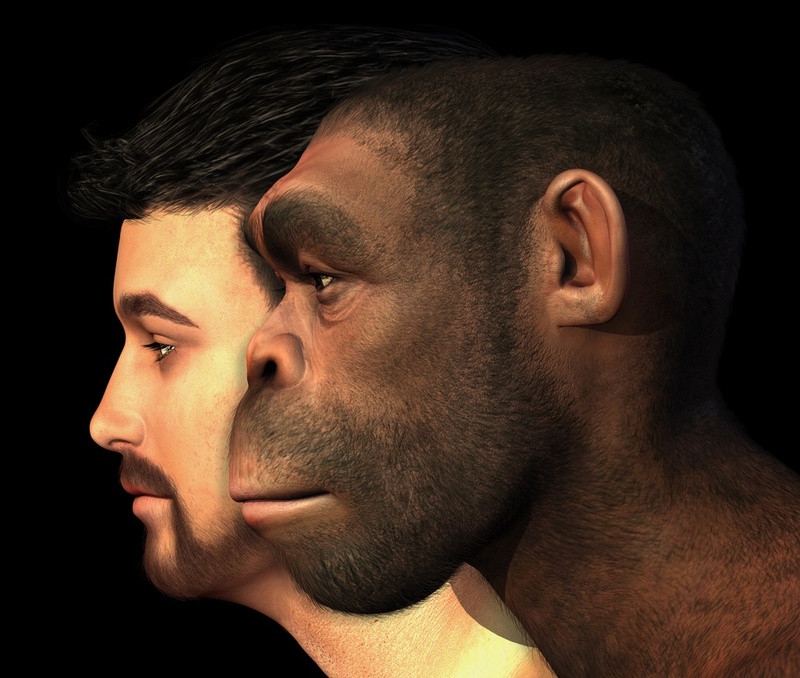 This picture is a comparison of a homo erectus head vs a homo sapien head. Which one most resembles Patty? The homo erectus has a receding chin or to say the lips extend past the point of the chin. Hmmm ... no, i don't think so. In the picture in post 44 I think she's looking downwards at a pretty steep angle. Look at the line from the base of her skull down into her shoulders. Spine at shoulders is at the back, not front, of the chest. If you rotate the picture in post 44 so her neck area is vertical so you get an apples to apples comparison to the other two, it is pretty striking: her chin is considerably more prominent than either the H. sapiens or H. erectus. In #48 the homo sapien chin sticks out PAST the lips. This is how my chin is, its also called a lantern jaw. Pattys lips stick out past her chin and quite possibly her nose. Which matches the homo erectus figure quite nicely. Yep, since I don't see that at all (because I think she is looking down at a pretty steep angle which you're not correcting for) we're just going to have to disagree. Onward! In the image above, both the erectus and the sapien lips extend beyond the chin. That feature seems nearly as common with humans as does the opposite feature: chin extending beyond the lip. Patty's appearance seems to be somewhere in-between. Isn't that the same thing we are seeing with the other new primate discoveries? Hmmm. Seems a futile argument to me. three-quarters views. The amount of variation in human faces is great and amazing! That's what keeps caricature artists in business. ... Patty's hooded nose is a nice, homo feature. It did in response to toxins in vegetation, likely as you state if I was a gambling cryptid. Neanderthal, Heidelbergensis where the robust forms. They are considered extinct though they may have Patty to contend with. There are robust humans but they have not individuated into a new separate species as yet. I'll go with a hooded nose, although the sunshine spectral reflectance of Patty's face washes out a lot of what would have been very good detail on the nose, cheek, and forehead on the sun-ward side. Still if gorilla like I think I would see prominent nose holes. The nose is extremely broad and flat however and seems to merge with the angle of the cheek planes at a very low angle. 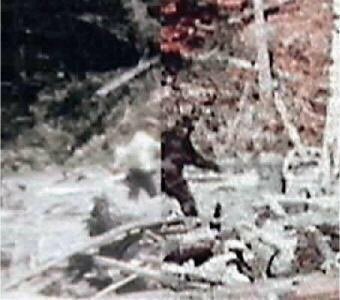 It is considered by Meldrum that Bigfoot likely developed walking independently of the Genus Homo. (That would be assuming it was more Genus Australopithecine and/or on the borderline with Homo Habilis, Homo Erectus, and possibly a hybrid of all these. Apes had to use their feet in the trees so The fact that BF may not be tree dwellers anymore but retained more functionality of the foot. Perhaps for the more uneven and difficult terrain of high elevations? The linear model for human evolution probably does not do justice to how BF would have had to evolved to be present in the modern era. You should google "human receding chin" for some more context, but if I'm choosing between these two, Patty could easily fall within genus homo. Maybe she's somewhere in between those two. Here are a couple profile I picked out of the PG film that shows the best profiles for this I hope. If you click on it, it expands to a larger size. Ok, so you think her chin falls within the range of Homo Sapiens do you? What about the rest of her peaked head? Her neck? Her bulk? The two inch deep tracks she left behind? Her furry coat of hair that covers her entire body? The fact that she is naked in fall in the coastal mountains of California? The fact she carries no kit what so ever? The fact that she drawfs a 6'6" homo sapien male? Her ape like arm length? I think you guys need to refine what you consider "human" and why.....because from my perspective you guys are awarding this to her based on the fact that she walks on two feet and has two arms and a head attached to the top of her torso....... nevermind that the similarities come to a screeching halt there. I've said it before I'd feel about the same dating Koko the gorilla as I would about dating Patty. Thats because she isnt remotely close to our species.